A WELL-PRESERVED skull from 1.8 million years ago offers new evidence that early man was a single species with a vast array of different looks. 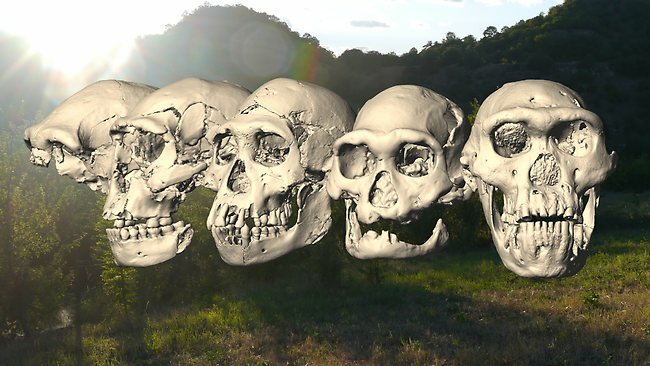 With a tiny brain about a third the size of a modern human’s, protruding brows and jutting jaws like an ape, the skull was found in the remains of a medieval hilltop city in Dmanisi, Georgia, said the study in the journal Science. 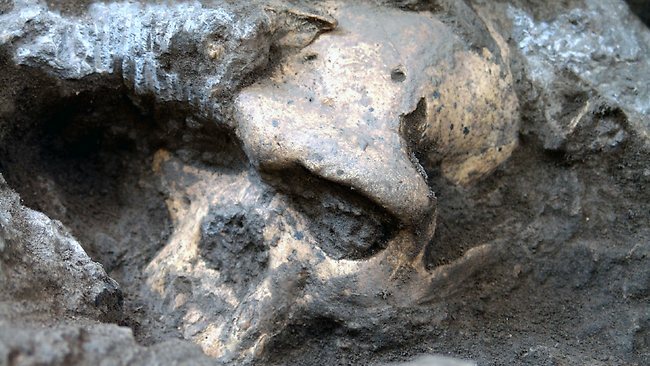 It is one of five early human skulls – four of which have jaws – found so far at the site, about 100 kilometres from the capital Tbilisi, along with stone tools that hint at butchery and the bones of big, saber-toothed cats. 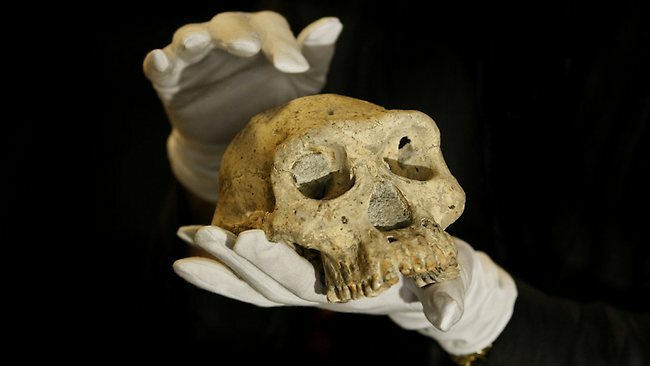 In this photo taken October 2, 2013, in Tbilisi, Georgia, David Lordkipanidze, director of the Georgia National Museum, holds a pre-human skull found in 2005 in the ground at the medieval village Dmanisi, Georgia. “Yet we know that these individuals came from the same location and the same geological time, so they could, in principle, represent a single population of a single species,” he said. The researchers compared the variation in characteristics of the skulls and found that while their jaw, brow and skull shapes were distinct, their traits were all within the range of what could be expected among members of the same species. 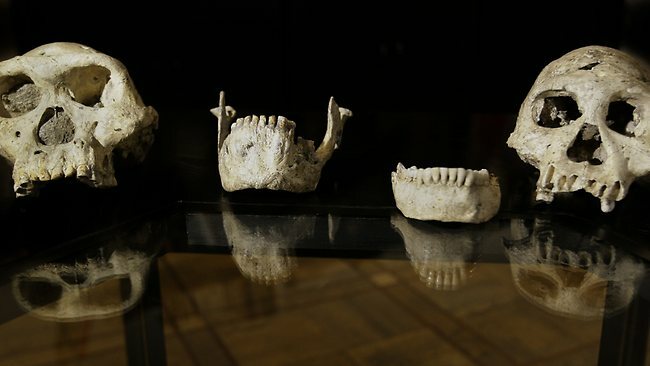 “The five Dmanisi individuals are conspicuously different from each other, but not more different than any five modern human individuals, or five chimpanzee individuals, from a given population,” said Mr Zollikofer. A reconstruction of the early homonid from the Georgian skull find. 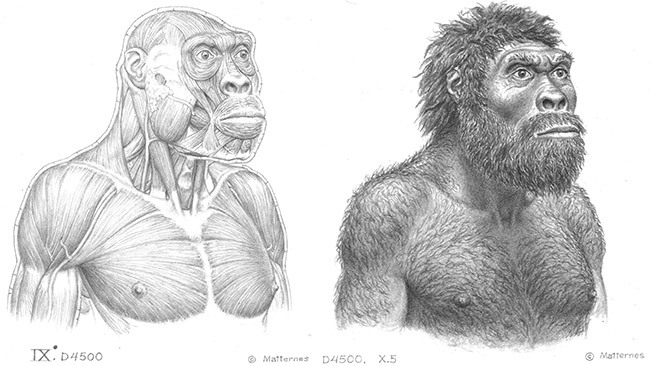 Under that hypothesis, the different lineages some experts have described in Africa — such as Homo habilis and Homo rudolfensis — were all just ancient people of the species Homo erectus who looked different from each other. It also suggests that early members of the modern man’s genus Homo, first found in Africa, soon expanded into Asia despite their small brain size. “We are thrilled about the conclusion they came to. It backs up what we found as well,” said Milford Wolpoff, a paleontologist at the University of Michigan. Mr Wolpoff published a study in the journal Evolution last year that also measured statistical variation in characteristics of early skull fossils in Georgia and East Africa, suggesting a single species and an active process of inter-breeding. The fossilised remains of the early homonid were uncovered in a small stone grotto near the city of Dmanisi, Georgia. “Everyone knows today, you could find your mate from a different continent and it is normal for people to marry outside their local group, outside their religion, outside their culture,” Mr Wolpoff said. “What this really helps show is that this has been the human pattern for most of our history, at least outside of Africa,” he added. 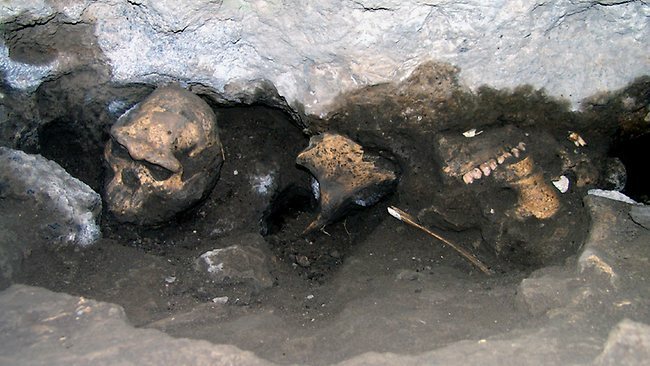 This 2005 photo provided by the journal Science shows a pre-human skull found in the ground at the medieval village Dmanisi, Georgia. “I think that the conclusions that they draw are misguided,” said Bernard Wood, director of the hominid paleobiology doctoral program at George Washington University. “What they have is a creature that we have not seen evidence of before,” he said, noting its small head but human-sized body. In this photo taken October 2, 2013, ancient skulls and jaws of pre-human ancestors are displayed at the Georgia National Museum in Tbilisi, Georgia. The name also retracts the unique species status of Homo georgicus given to the jaw that was found in 2000 along with other small, primitive skulls. The jaw lay a few metres from where Skull 5, belonging to the same owner, was later discovered in 2005. Its discovery, in such close quarters with four other individuals, offered researchers a unique opportunity to measure variations in a single population of early Homo, and “to draw new inferences on the evolutionary biology” of our ancestors, she said.